In the United States, the stewardship and management of approximately 599,000 bridges present ongoing planning, operational, maintenance, and economic challenges for Federal, State, and local transportation agencies. To help overcome these challenges and foster the next generation of bridges and bridge management systems, in April 2008, the Federal Highway Administration (FHWA) launched the Long-Term Bridge Performance (LTBP) Program, a major new strategic initiative designated as a flagship research program. The LTBP Program is intended to be a long-term research effort with the objective of collecting scientific quality data from a large number of our Nation’s highway bridges—those representing the most common bridges in the National Bridge Inventory—to provide a more detailed and timely picture of bridge health and bridge performance. Improved knowledge of bridge performance. Advances in deterioration and predictive models. 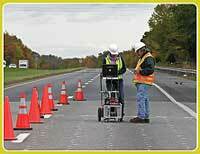 Deterioration models, which can simulate interactions between pavement, bridges, and traffic. Effective use of life-cycle cost analysis. Support for development of improved design methods and bridge maintenance/preservation practices. Quantification of the effectiveness of various maintenance, repair, and rehabilitation strategies. Improvement of the operational performance of bridges with the potential to reduce congestion and delays. Fostering of the next generation of bridges and bridge management systems. Contributions for setting national policy. Ultimately, improved understanding of bridge health and bridge performance will promote the safety, mobility, longevity, and reliability of the Nation’s highway transportation assets. 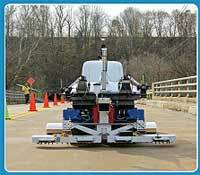 In a single pass, this robotic system developed in a collaboration between Federal Highway Administration and Rutgers, The State University of New Jersey, can gather a wide range of data—high-resolution photographic, electromagnetic, seismic, and electrical— for external and internal deck conditions. The robot automates data collection and deploys multiple nondestructive evaluation (NDE) technologies, simultaneously, which greatly increase the speed and comprehensiveness of the information gathered. Perhaps the most revolutionary aspect of this robotic system is its enhanced data interpretation and visualization capabilities. Thanks to data integration, fusion, and three-dimensional rendering, the robot, can provide a three-dimensional image of the deck by combining data sets, producing an almost instantaneoussnapshot of bridge deck condition that is easy to interpret. This novel method of using technology integration to gather quality data on deck conditions will improve our knowledge of bridge deck performance. Global Positioning System precisely tags condition data with exact location using global coordinates. 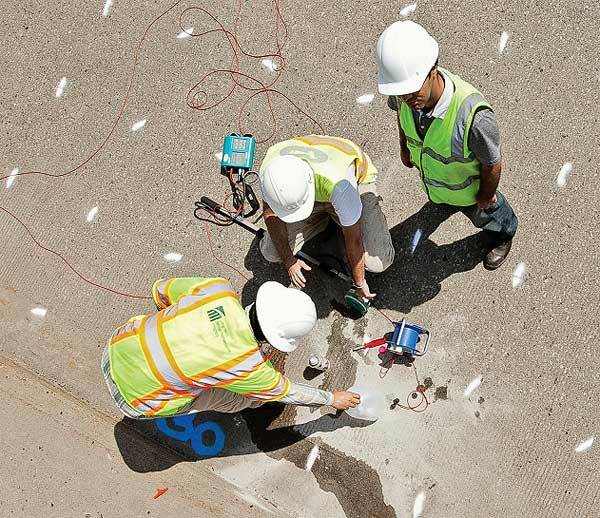 Ground penetrating radar (GPR) provides a qualitative condition assessment of bridge decks. It can be used as a diagnostic tool for detecting apparent or suspected deterioration (such as delamination or corrosion) in an existing deck, or as a quality assurance tool for new construction or rehabilitation. 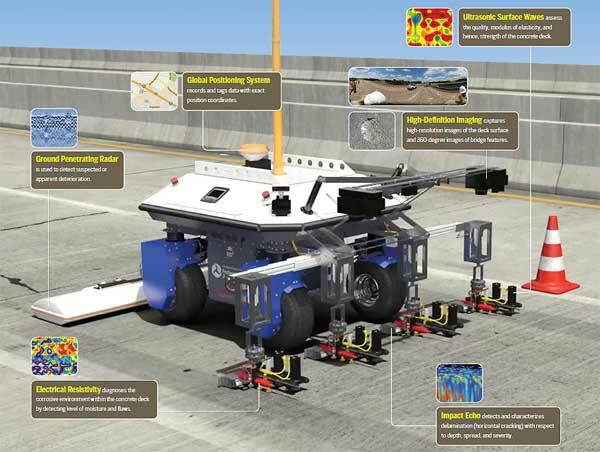 The GPR system on the robot uses a dense array of groundcoupled antennas, which enable assessment with high spatial resolution. Impact echo (IE) is a seismic or stress-wave technology used to find defects and anomalies in concrete. IE is primarily used to detect and characterize delamination (horizontal cracking), including depth, spread, and severity. Other applications for IE include detection of debonding on decks with overlays. The robot is equipped with more than a dozen IE devices. Electrical resistivity measures the resistance to the flow of electricity in a particular environment. A corrosive environment contains more water, chlorides, and/or salts or other contaminants, making it more conducive to electricity flow. Therefore, the higher the resistance measure, the lower the corrosion. The electrical resistivity of the concrete is inversely related to its potential for corrosion. This same relationship can be seen with many cases of reinforcing steel, as well. Ultrasonic surface wave (USW) testing is used to assess the quality and modulus of elasticity, and hence, strength of the concrete deck. 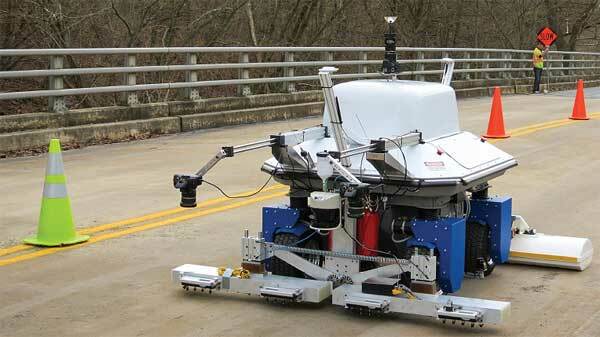 The robot uses multiple sensor combinations to simultaneously evaluate concrete modulus across eight deck locations. 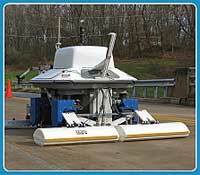 The robot uses three high-resolution cameras to capture images of the deck. Two cameras mounted on the front capture high-resolution images of the deck surface that are automatically stitched to provide a holistic deck-surface image; deck cracks are read from these images, and the lengths and widths of the cracks are mapped. The third camera is mounted on a tall mast and provides 360-degree images with visual information on the presence and condition of barriers, poles, curbs, and so forth. Firas I. Sheikh Ibrahim, Ph.D., P.E.